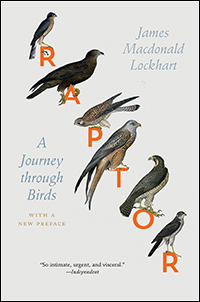 In Raptor: A Journey Through Birds, James MacDonald Lockhart loosely follows William MacGillivray, the nineteenth century ornithologist, from Scotland south, searching for the fifteen species of British raptors. I’m familiar with most of the UK raptors, for we share several genera and species, but the Honey Buzzard (Pernis apivorus), a rare bird in the UK, is quite new to me. This is a bird that favors feeding on wasp larvae, its feet and bill rather different from the run of the meat-ripping-raptor mill. It will dig up nests to get the grubs. Here’s some video of the wasps’ response. In the middle of the last century, Lockhart would have found many fewer raptors or none at all. This is the undercurrent of J.A. Baker’s remarkable The Peregrine. Hunters, farmers, egg collectors, habitat-destroyers, then DDT. Today, re-introductions, legal protections, and education mean there are many more raptors British Isles. “You cannot separate the story of Britain’s birds of prey from the birds’ relationship with man. That relationship is the birds’ story.” For at the edges, the ravening hominid still lurks, the old battle is still being waged between the destroyers hungry for profit and the conservationists. The Hen Harrier (Circus cyaneus)*, for instance, is ruthlessly persecuted by “gamekeepers,” employees of large grouse-killing estates. These bastards kill all the raptors they find, just to be sure they get the harriers. In fact, the Hen Harrier rarely predates grouse, but reality, as you know, doesn’t match up well with belligerent ignorance. And of course, the oligarchical types who blast grouse out of the sky are the same shits assaulting the precarious protections we’ve managed to carve for our only planet and its soil, air, water, and food. This isn’t a tangent. I didn’t expected Lockhart, in his peregrinations, to discuss the clearances and enclosures that have so brutalized Britain. But there you go. Wandering the land you should not miss them (the same goes for here, where traces of ethnic cleansing and genocide stain the map). “In the end all landscapes tell the same stories,” he says, “Everywhere is layered with the same strata of clearances, displacements, resettlements.” This nasty history is rarely portrayed in the reactionary television soaps about the toffs and their servants, classes created by this violent usurpation of land and justice, that some Americans seem to devour like sticky toffee pudding. *Just this year, the nabobs of taxonomy split our Northern Harrier from C. cyaneus; our sole harrier species is now C. hudsonius.